Bulgarians go to the polls on 12 May in an early election after nationwide protests against low living standards and widespread corruption forced the government of the centre-right GERB party to resign in February. The election campaign has been marred by revelations of illegal wiretapping of politicians, with prosecutors pointing a finger of blame at GERB's second most senior politician, former Interior Minister Tsvetan Tsvetanov. Opinion polls have predicted that no party will win an outright majority, prompting fears of a hung parliament and further instability in the EU's poorest country. Who is likely to be in parliament? Despite being brought down by street demonstrations, GERB, headed by former Prime Minister Boiko Borisov, continues to lead in opinion polls, with an approval rating of over 20%. This, however, does not guarantee that it will lead the next government in Sofia. If predictions of a hung parliament materialise, GERB will have to form a coalition. This could prove impossible as all parties with a chance of winning seats in the National Assembly have declared their unwillingness to govern with Mr Borisov. His main rivals, the Bulgarian socialists (BSP), are not far behind, with some polls giving them just 5% less than GERB. 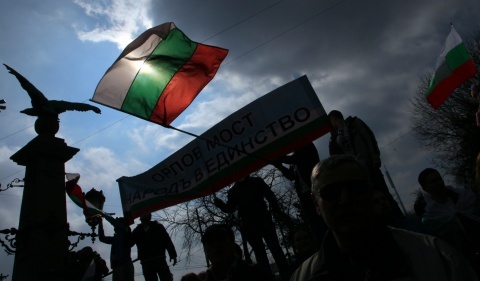 Other parties expected to pass the 4% threshold needed to enter parliament are the Movement for Rights and Freedoms (MRF), which represents the ethnic Turkish minority in Bulgaria, the ultra-nationalist Ataka, and the centrist Bulgaria of the Citizens led by former European Commissioner Meglena Kuneva. How significant is the eavesdropping scandal? Claims by the main opposition party, BSP, that Mr Borisov's political opponents had been illegally bugged led to an investigation. Just before polling day, prosecutors accused ex-interior minister and GERB's campaign manager Tsvetan Tsvetanov of "deliberately allowing his subordinates, the directors of the wiretapping department, to commit crimes". Mr Tsvetanov, who cannot be charged because he currently enjoys immunity as a parliamentary candidate, has denied any wrongdoing. The accusation, however, seemed to lend weight to allegations of widespread eavesdropping, and came after former agriculture minister Miroslav Naydenov had publicly accused Mr Tsvetanov of bugging even government ministers. A leaked recording of a secret discussion between Mr Borisov, Mr Naydenov and an acting prosecutor about a bribery probe against Mr Naydenov himself deepened the mystery. Mr Borisov then used the incident to claim that he too was a victim of bugging. Opinion polls suggest that the wiretapping scandal has started to erode support for the former ruling party. And while the state of the economy was still the main concern for voters, anger at corruption was again gaining prominence. Who will form the new government? Most analysts in Bulgaria predict that the elections will produce a highly-fragmented parliament that will in turn lead to an unstable cabinet. If the polls are right and GERB does not win enough votes to govern on its own, it could form a minority government. The cabinet would, however, be dependent on the support of parties that have already declared their hostility towards a new Borisov administration. Other options would be a coalition of anti-GERB parties or an all-party agreement to form an expert "national salvation" government that would try to get the country out of the economic crisis. This would be a daunting task for any future cabinet. Although all political parties have promised to keep the currency board that pegs Bulgaria's lev to the euro, the economy is still in a very bad shape. A recent study by the Bulgarian Industrial Association (BIA) shows that investment in the country has declined by 79% in the last five years, and that 46% of enterprises have virtually stopped working. BIA also disputes official figures that put unemployment at 12%, saying that the actual rate is over 18%.